We believe that we are coming full circle in history, returning to the roots in Jerusalem and Israel. The greatest battles in Israel today, which affect all of the Middle East and the whole world… are the places where Abraham Built altars to God and where God made covenants with His people. In Shechem (Nablus), Beth El (Ramallah), Hebron (Kiryat Arba), and Mount Moriah - Jerusalem, where Abraham, Jacob and David built FOUR Altars and pillars to the Lord, here God made covenants with them and their offspring. Understanding God’s covenants with Israel in Genesis 15 on Mount Hermon and the Four Altars that Abraham built in Shechem, Hebron, Beth El and Jerusalem and understanding God’s purpose of restoration in these last days will give perspective and keys to help clarify events in our days and to unlock the foundations and pillars of God’s peace plan in Messiah. God wants to establish His peace plan in Israel and the Arab Middle East. God is a covenant keeping God both for Israel and the Church. If God did NOT keep His covenant with Israel… there would be NO reason for Him to keep them with the Church. The God of Israel made covenants with Abraham, Jacob (whose name was changed to Israel), and David, King of Israel at the place where the FOUR ALTARS of Covenant were built. Abraham, Jacob, and David made covenants with the God of Israel by building altars and purchasing land in these places over 3, 000 years ago, which is more than 2, 000 years before ISLAM shows up in history. This clearly indicates that the land was covenanted to them (the Jews) by God and that He has ordained the Jewish people to be stewards over JUDEA and SAMARIA (so called West bank), the heartland of Israel including the altars, foundations, and pillars established in Shechem, Hebron, Beth El and Jerusalem. Heathen nations and Arab’s - Muslim’s call Judea and Samaria the “OCCUPIED TERRITORIES” and the “West bank.” This very heartland is where the Muslims and many other nations want to establish an Islamic Palestinian State. Unless, God intervenes due to prayers, fasting and mourning of Jews and Bible-believing Christians the USA and other nations, even S.A… will be judged for dividing up the land of Israel. We must realize what the enemies of Israel are trying to do! They are trying to destroy the foundations, knock down the pillars of the house of Israel and cause the Jewish people to break covenants with their God in the very places where God made covenants with them. All replacement theologies and ideologies are born out of rebellion against the Covenant God of Israel and the Abrahamic covenants. Those who deny God’s just choice of Isaac and Jacob and say that God chose Ishmael or other replacements are enemies of God. This is because they worship another God, a moon god, not the ONE TRUE Covenant God of Israel. Islam teaches that the whole world, especially the heartland of Israel, should submit to Allah and Islamic rule. It is not a matter of giving the Palestinians land to live on… we are dealing with something that has to do with the kingdoms of darkness against the Kingdom of our Lord and His Messiah… we are dealing with covenants. Islam is trying to uproot God’s covenant people and lay the foundations of Islam in the places where God made covenants with His people. The Palestinians have been demanding that Beth El, Shilo and all the places of God’s covenants be evacuated so that the foundations of Israel are destroyed and another foundation can replace God’s covenants and the Jewish communities in these areas. Abrahamic Covenants belong not only to all Jews but also to Christians worldwide, as they were made both naturally and spiritually in these places, as we are all called to be children of faith. A house united will stand BUT a house divided will fall! The covenants God made with Abraham, Isaac, Jacob were in and for THE WHOLE LAND OF ISRAEL, but specifically made in the heartland of Israel, the mountains of Israel, the West Bank of the Jordan River, Biblical Judea and Samaria, Mount Hermon, Shechem, Beth El, Hebron and Jerusalem. These covenants are FOREVER! The Lord commanded Joshua to fulfill His Covenant by possessing the WHOLE Land (Joshua 1:1 – 11) and God is speaking this same word again today to Jews… and to Christians worldwide to stand with the God of Israel and His covenants with the land of Israel to be fully possessed both naturally and spiritually. After the seriously failed attempt of the Oslo Accords and the Road Map of the Nations, Israel seems to NOT have learned from that tragic mistake. Today plans are again being made to try giving this land; the heartland of Israel and the places of God’s covenant with Israel, for a Palestinian Islamic State. Bible-believing Jews and Christians need to rise in faith together to stand with God’s covenant to possess and restore the altars, foundations and pillars in Israel’s heartlands. God’s Covenants with Abraham on Mount Hermon for the WHOLE Land of Israel… The first place Abraham arrived at after departing from Haran (today situated in Turkey), was northern Israel. There it seems that he crossed over Mount Hermon. Jewish tradition says that God’s covenant with Abraham in Genesis 15 took place on the heights of the Golan on top of Mount Hermon. Today, still remains a building to commemorate it…! Not only did God give the land to Abraham’s offspring in Shechem, but also to Jacob! (Genesis 33: 18) In Shechem, Jacob formally acknowledged the God of his father as his God… Halleluyah! God brought Jacob back to the same place where God made a covenant with Abraham and where Abraham built an altar. Because God made a covenant with Abraham first, Jacob could see what God did in regard to its establishment, return to that place and renew the covenant. There, Jacob bought the land and like his fore-father, built an altar to the Lord. Because Jacob recognized the seriousness of the commitment of God to make covenants with Israel in this place, he not only built an altar but also… bought the piece of land and dug a well. Genesis 37 describes that near where the covenants were made; his brothers sold Joseph into slavery into Egypt where the Jews lived for four hundred years. Joshua 24:32 says that after coming out of Egypt four hundred years later, Joseph’s bones, which the Israelites had brought up from Egypt, were buried (back) at Shechem in the tract of land that Jacob had bought for a hundred pieces of silver from the sons of Hamor, the father of Shechem… and this became the inheritance of Joseph’s descendants. Also, near Shechem, in the hill country of Ephraim, God gave Joshua, one of Joseph’s descendants, his inheritance – Timnath Serah – a city of Samaria (Joshua 2:49, 50). Four hundred years after Joseph was sold into slavery in Egypt, as Abraham saw would happen in his vision in Genesis 15, Joshua led the Israelites into the land promised as an oath to Abraham, Isaac, Jacob and their descendants as an inheritance. When Joshua came to Shechem, he built an altar to the Lord as Moses commanded in Deuteronomy 27 and Joshua 8:30 – 35. In February 2003, Joseph’s tomb was destroyed by Muslim terrorists in Shechem trying to drive the Jewish people from these foundational places of covenant. Few Jews or Christians reacted or protested. If Jews are the children of Abraham and Christians are the children of Abraham by faith, as the Bible says… then we ask, why do they allow the places of the foundation of our faith to be destroyed? When Yeshua (Jesus) ministered to the Samaritan woman (John 4: 12 -14; John 4:22 -23) at Jacob’s well, which is in Shechem on the ground that Jacob purchased and near where Joseph’s bones were buried. Yeshua asked her for a drink from the well and told her that she should receive “living water,” the Holy Spirit. The next place Abraham came to after building the altar in Shechem is… Beth-El (Ramallah). There he built another altar unto the Lord. (Genesis 12:8 - 10) After building the first two altars, Abraham set out for the Negev and went down to Egypt. After Abraham came out of Egypt he returned to the place where he built the altar to the Lord in Beth-El. While in Beth-El, God spoke to Abraham (Genesis 13: 14 -17) and promised him the land. From Beth-El you can see the snow on Mount Hermon to the north; Jerusalem, Gaza, and the mountains of Hebron to the south; the mountains of Jordan to the east; and the Mediterranean Sea and Tel-Aviv to the west. Abraham saw the land promised by the God of Israel from Beth-El. Abraham was not the only one who built an altar at Beth-El. Jacob also returned to Beth-El (Genesis 28:10 – 22 because he wanted to enter into the covenants of his father. When God makes covenants with people they want to return to those places of covenant! God was with Abraham in Beth-El and brought Jacob back and “opened the heavens” and opened these covenants from the heavens on earth with Jacob. “When Jacob arose, he said, “…this is none other than the House of God and this is the gate to heaven,” Genesis 28:17. Jacob returned to Beth-El again (Genesis 35) there in Beth-El, the place of making covenants and setting up pillars, there God changed Jacob’s name to ISRAEL! Beth-El is the place where Israel was conceived (Genesis 12 and 28) born (Genesis 35), and the name of Jacob changed to Israel. After King Solomon sinned, his kingdom split. Jeroboam, in rebellion with the northern kingdom of Israel, built an altar to “Baal” and a golden calf in Beth-El (1Kings 12:25; 13:10). Hosea and Amos refer to this as the worst idolatry in Israel. 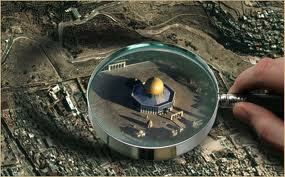 (Hosea 4:15; 5:8; 10:8 and Amos 4:4; 5:5) Today ISLAM is trying to rebuild the altar of “Baal” in Ramallah (Beth-El). 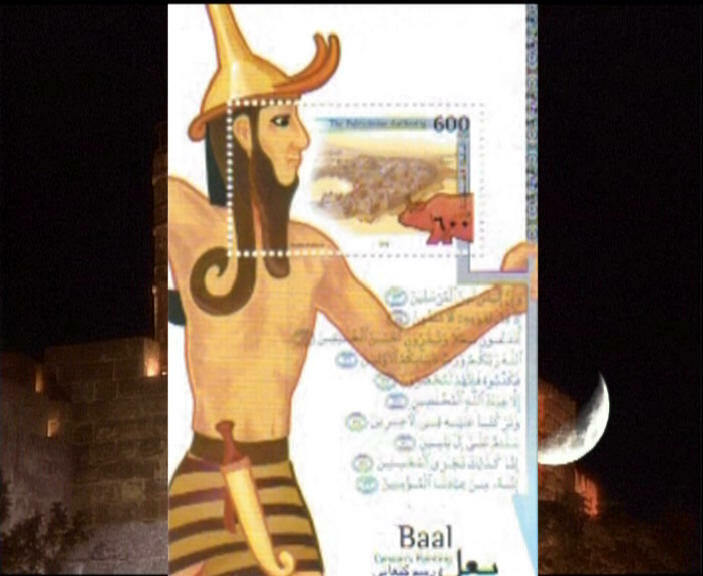 The Palestinian Authority even has "Baal" on its postage Stamp! Beth-El is the place where God said to Abraham, "your heirs are going to be blessed." Christians are the off-spring of Abraham by faith coming into the promise through the Messiah and He wants to bless them from Beth-El… And, that’s why it is VERY important for Beth-El to be returned to Jews as it was God’s covenant land to them! As we have discovered… Bethel means "House of God"… and was the place where Jacob made an important covenant with God (Genesis 28:20 - 22). He erected an altar to mark that place, and later returned there to worship the Lord (Genesis 35:1-15). There, God promised to give the land of Canaan (Israel) to Jacob's descendants. Bethel is also called "The Gate of Heaven" and represented God's presence in Israel. This covenant between God and Abraham became the bedrock of Israel's claim to the land. For this very reason it is called the "Promised Land." Romans 14:17 says… that the kingdom of God is Righteousness, SHALOM (peace) and Joy in the Holy Spirit. Heaven is a place of holiness and righteousness. Heaven is filled with "shalom." 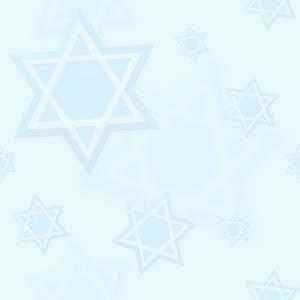 The word Shalom means peace, safety, quite, wholeness, hello and goodbye. The word "shalom" is the word for greeting one another in Israel. When we greet others by saying, "shalom" as believers we are saying / proclaiming "may the "shalom" (peace) that is in heaven be manifested in your life on earth." What a powerful proclamation or greeting! Truly the New Covenant is the key to opening up the way to salvation as Yeshua passed over from heaven to earth and from death to life (John 5:24) to bring salvation. Our roots as Christians do NOT begin with Golgotha or the Garden Tomb, the Upper Room or the Apostles. Our Jewish Hebraic Roots begins with… the God of Israel – Yeshua’s (Jesus’) promise and covenant to us through Abraham and later in Jacob (Israel) in Beth-El, the "House of God." This is the place of the roots of our faith in Yeshua through Abraham, The man of faith and father of us all, and Jacob whose name was earlier changed to Israel. Through Abraham’s, Isaac’s, and Jacob’s offspring (seed), Israel and the Church in the nations were born and blessed. The seed for the Church, the house of prayer for ALL nations, were born out of Israel in Beth-El. If we allow the Muslims to take down the pillars and foundations of the House of Israel… then how can Israel stand and come into her full restoration and destiny in Messiah? BUT this is what many nations of the world is demanding today, and even many nominal Christians who do NOT understand the Scriptures are demanding as well. They say the only way there can be peace is when the Jews leave the places of covenant that the God of Israel made with them…! However, this peace will only come when the Prince of Peace comes. After Abraham left Beth-El he went to Hebron, near the trees of Mamre, where he built his third altar. (Genesis 13:14 – 18) In Hebron, Abraham bought land – the field, cave, and all the trees of the field of Machpelah – to possess as a burial site for his wife and descendants. The land became a legal possession and an inheritance in the presence of all Hittites. 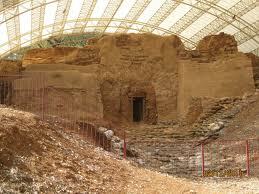 (Genesis 23:17 – 20) The place where Abraham built his third altar, Hebron, is a very significant city. It represents "Fatherhood" and "Friendship." Hebron is the home of the "Fathers" and is the place where Abraham Isaac and Jacob lived and were buried. Jewish tradition says that even Adam and Eve are buried in Hebron! In Hebron, Isaac and Ishmael again met in the natural to bury their father. Hebron a city of refuge in Judea was given to Caleb because of his faithfulness and good report (Numbers 13:26; 30 – 32; 14:7 - 9) Like Abraham, Isaac, Jacob and Caleb, David too moved in an intimate friendship with God. Hebron is a city where David was anointed King of Judea and later, King of United Israel. It is where David reigned for seven years before his thirty year reign in Jerusalem. The first part of David’s reign was in Hebron because of the significance of that city, as a place of "Fatherhood and Friendship." Then God brought him up to Jerusalem. By building his third altar in Hebron and the forth altar in Jerusalem, Abraham prepared the way for David to rule as King in both Hebron and in Jerusalem. Jerusalem is first mentioned in Genesis 14:18 – 20 when he meets Melchizedek, King of Salem and priest of the most High God. The second mention of Jerusalem is when God tells Abraham to take his son Isaac to Mount Moriah, Jerusalem, and offer him as a sacrifice. The altar built on Mount Moriah is the MOST SIGNIFICANT altar, because the ram of sacrifice is a picture of the "Passover Lamb." (Genesis 22:2 -5) Abraham was giving the life of his son that he had waited for until he was almost a hundred years old. He was offering up his son as worship to God. He thought he was going to kill his son. He said; "… we are going to worship God." If God were to ask you to sacrifice your life and your son as worship, would you do so? Abraham was willing and so committed to God’s covenant that he realized that even if he had killed his son in worship his son would be raised from the dead to fulfill God’s covenantal promise forever. Isaac, his son was born out of a miracle and if God can perform one miracle then He could perform another. King David’s covenant altar in Jerusalem… Abraham was not the only one to build an altar on the Mountains of Moriah – King David did as well. David NOT only built an altar but also purchased land from Araunah the Jebusite, where the temple and his altar were built thereafter. (2 Samuel 24:16 -23) Kind David, opposing Araunah’s request, did not accept the land, the wood, the grain or the animals as a gift but bore their price by buying the land for 50 Shekels of silver. As the whole world continues to watch with intense interest the developments within the arena of the Israeli-Palestinian Conflict, there is one dimension that is always entirely dismissed as irrelevant to the debate…. And that absolute rock solid fact is that the Holy Bible is relevant to the entire drama… The world just doesn't get it! The world thinks that the Israeli-Palestinian Land Conflict is just another one of the many earthly complex squabbles over human rights, land distribution and differing religions. The multitude of UN resolutions and peace processes regarding the ancient land feud between the Jews and the Arabs reflect the reality that the world is seeking to resolve this burdensome dilemma through humanistic mediation rather than consider the Bible. The last thing in the world that any diplomat, politician, or national leader cares about hearing is… that the Bible might be relevant to the whole controversy. Today, the Middle East commands the whole world's attention… And in the ever building drama around the controversy over the "disputed territory" a massive supernatural confrontation looms on the horizon. It is a battle between holy books and between the God of the Holy Bible and the multiplied mini gods of world religions. The central issue in the Middle East is whether the Bible or the Koran has Divine authority. Israel's most basic need today is not a secured peace arrangement with the Arabs; rather it is reconciliation with the God who gave them the land in the first place. The whole world groans until the peace of Jerusalem becomes a reality. The return of Israel on the world stage in modern times to a portion of the "Promised Land" is setting the climatic tone for Yeshua (Jesus) own prophecy (Matthew 24:32-33) related to the budding of the fig tree. To whom does the land really belong? That question is undeniably the most explosive issue of our times. And the world simply will not consider the Bible as being a legitimate document for clarifying the ownership of the disputed land. The great "I AM" of the Holy Bible maintains that it is his land, and that he gave it to Jacob as an everlasting deed. The Holy Bible conveys that he will give the land to Israel in the Last Days, and that finally they will enjoy the full possession of the "Promised Land." The "cup of trembling" which the Promised Land is to the nations of our world today is land that belongs to God. He has stipulated that Israel has no right to sell, bargain, trade, or negotiate away any piece of that land. Is the Bible relevant to the land dispute? Every nation on the earth needs to reconsider that issue, because God has stated on record that he will destroy all nations that come against his people after he has restored them to the land that he gave them. How we pray that nations and world leaders could understand that it is a fearful thing to disregard God's word concerning the hotly contested "disputed land" land of Israel! Since God is the architect and designer of the entire universe and overrules in the affairs of nations and men, then you can rest assured that the present Israeli-Palestinian and Middle East Conflict has not caught him by surprise.